You’ll notice two things right off the bat in Mark – the prose is terse and disjointed, and there is no birth story. The author begins by referring to Jesus as Christ, or Messiah, depending on the version you read. They both mean Anointed One (Christ is Greek; Messiah is Hebrew). Next there’s a claim that John the Baptist fulfills the prophesy in Malachi 3:1 and 4:1,5. But that prophesy doesn’t fit – there’s no fire, and later (in John 1:21), John the Baptist will flatly deny that he’s Elijah. Furthermore, as the SAB points out, the part about the messenger is not from Isaiah. V3, though, is from Isaiah (40:3). 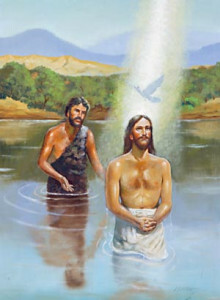 In v 9, Jesus is baptized in the Jordan River, and the supernatural events begin. In v 23 we have Jesus’ first magic trick – casting out an evil spirit. From the description, it was probably a seizure. Next he heals Simon’s mother-in-law from a fever (as the SAB facetiously points out, so that she could then wait on them). V 34 mentions that Jesus did not allow demons to speak after he cast them out, because they knew him. What’s that supposed to prove? V 41 is contentious – some manuscripts say that Jesus was moved with compassion, but others indicate his emotion was anger. Bible scholar Bart Ehrman has stated that likely the word anger was later changed to make the verse less ‘problematic’. Either way, why would Jesus tell the guy to keep quiet? We begin with Jesus healing a paralyzed man by forgiving him (for what?). More than a few quadriplegics must be wondering why recovery was so easy back then, and where Jesus is now. V 10 is the first instance of Jesus calling himself the ‘Son of Man’ – a la Ezekiel. Next he adds a tax collector as a disciple, and then dines with a bunch of sinners. The NLT actually refers to them as ‘scum’ (v 16). V 18-22 are a confusing discussion about fasting, and wineskins. I had to look to an apologist website to make sense of it. Jesus’ intent (apparently) is ‘out with the old, on with the new’ and ‘there’s a time and place for everything’. Meaning that when he’s around, the old rules don’t apply. And lastly, Jesus gets into a discussion about breaking the Sabbath laws. He defends himself by citing David – but he gets mixed up. David was alone (not with friends) when he became hungry enough to beg for holy bread, and the priest he begged from was Ahimelech (not Abiathar). (see 1 Samuel 21:1) Oops! Jesus starts out by breaking the Sabbath again, which causes the Pharisees (think of them as ‘Jewish fundies’) to begin plotting against him. He preaches to large crowds, but the evil spirits begin hounding him again (v 11-12). I couldn’t figure out why, but I found this explanation on an apologist site – “The demons addressed Jesus as the divine Son of God in a futile attempt to render him harmless. These cries of recognition were designed to control him and strip him of his power, in accordance with the conception that knowledge of the precise name or quality of a person confers mastery over him“. In v 13-19, Jesus appoints 12 apostles. There’s only one small problem – their names will vary from one gospel to the next. Another oops! And what happened to Levi, fromchapter2? Oh, wait – apparently he is really Matthew! Silly me! The story in v 20-28 is one I don’t remember hearing before – Jesus’ family accused him of being out of his mind. No mystery that it wouldn’t have commonly been read in my church. Jesus responds to accusations about Satan with a convoluted explanation, then ends with this admonition “I tell you the truth, all sin and blasphemy can be forgiven, but anyone who blasphemes the Holy Spirit will never be forgiven. This is a sin with eternal consequences.” (v 28-29) So Blasphemy becomes the Unforgivable Sin. I guess god isn’t all-forgiving after all. The chapter ends with him disowning his family in favor of his followers. Only one day into the gospels, and already I’m not inspired.